The Arab world will be "relieved" if Israel strikes at Iranian nuclear installations, PM Netanyahu said in an interview with Paris-Match. The Arab world would be "relieved" if Israel were to strike Iranian nuclear installations, Prime Minister Benjamin Netanyahu maintained in an interview published Wednesday by France's Paris-Match weekly. Netanyahu said that if Israel were to attack, "five minutes later, contrary to what sceptics think, I believe there will be a great feeling of relief throughout the region." 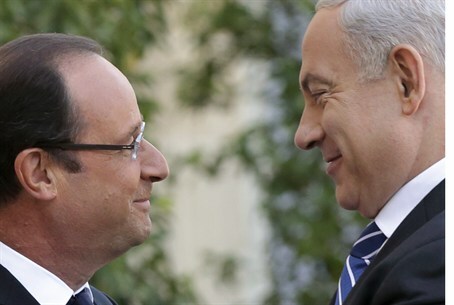 The interview with Israel's prime minister came out on the day he began a key two-day visit to France. "Iran is not popular in the Arab world, far from it," he said in comments reported in French. "And some neighbouring regimes and their citizens have well understood that a nuclear-armed Iran is a danger for them, not only for Israel," he said, without mentioning specific nations. Netanyahu has warned that a nuclear Iran would pose an existential threat to the Jewish State. He has repeatedly refused to rule out military action, fueling speculation in the international media that an attack could be imminent. Iran denies Israeli and Western suspicions that its nuclear program is a front for a drive for a weapons capability, despite its race to increase the number and capabilities of its uranium enrichment centrifuges at the Natanz and Fordow nuclear plants. Within the past year, the Islamic Republic has achieved the ability to enrich uranium past the 20 percent threshold -- meaning it is now capable of producing weapons-grade nuclear fuel. Netanyahu also said economic sanctions aimed at forcing Tehran to abandon its nuclear arms program were biting "but have not impacted on the nuclear program in any way," adding: "How do we know this? Because the regime is organizing tourist visits to its centrifuges." He said he would discuss "concrete ways of stepping up sanctions against Iran," in his first face-to-face talks with President Francois Hollande.